The hustle and bustle of the holiday season makes this introvert want to bundle up in her cocoon at any opportunity.While I love spending time with family and friends, there's something about curling up on the couch and watching a Christmas film in the glow of the Christmas lights. (Plus, going to the movies can get so expensive!) 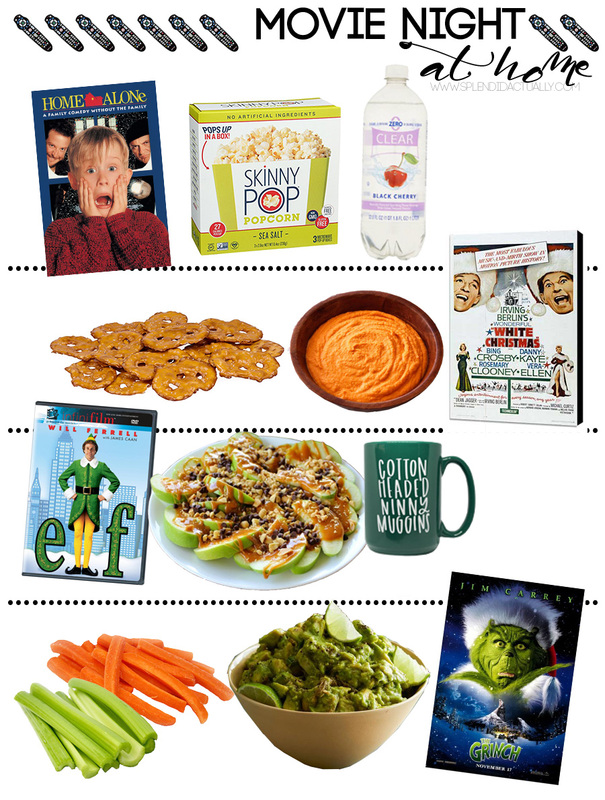 Today I thought it would be fun to pair up a few of our favorite holiday flicks with a few of my favorite snacks - and these snacks leave you feeling far less guilty than that tub of movie theater popcorn! This one is a classic in my opinion, so no better snack than another classic- popcorn. Recently I have become obsessed with Skinny Pop popcorn because the microwave version pops up into the coolest box turned bowl. Sea salt is my favorite. And opting for a flavored water gives you the carbonation to combat the salty snack without a bunch of harsh ingredients like in soda. Since Buddy would accept nothing but candy and syrup, I'm suggesting a sweet treat. Apple slices drizzled in melted peanut butter and a few mini chocolate chips. Along side my favorite hot cocoa recipe, it's the best combination for a sweet tooth. Heat your milk in a saucepan and add each ingredient in order, one at a time, whisking away any clumps. There's not necessarily logic behind this pairing, but hummus is my go-to snack for any day or activity. I prefer a flavored hummus, like roasted red pepper. I have made my own, but honestly, I like the convenience of picking it up at the deli! And pretzels add a great saltiness that I really enjoy in my snacking. This pairing seemed only right, considering the Grinch looks like a big ol' pile of guacamole anyway. I could dip anything in a bowl of cilantro-y flavored guacamole, but I love the crunch of celery especially. It's super easy to make too, mash up a ripe avocado, a splash of lemon juice, onion, garlic, cilantro and jalapeno if you like it spicy.